For many travelers, Africa is a continent which brings with it equal measures of fear and excitement. It is no secret that throughout this continent there are many dangers, many social and economic problems, as well as poverty and a lack of real infrastructure. With this being said, Africa is also one of the most beautiful continents on the planet, and one which is packed with places to explore, cultures to discover and experiences that will thrill you and leave you in awe. My favorite aspect of this continent is its nature, and these are the three experiences which will allow you to see it at its very best. I have always enjoyed hiking and climbing, and climbing Kilimanjaro was top of my list. Set in Tanzania this dormant volcano sits at a cool 4,900 meters in height. The best part about this mountain is that it is relatively easy and accessible to climb, providing you have a decent level of physical condition. They call this the Roof of Africa given its height, and both throughout the trek and from the peak, you can see some of the most incredible natural landscapes you are ever likely to see. In terms of animal spotting in Africa, it is tough to pick which experience is the best. You can see the big 5 in South Africa or watch Mountain Gorillas in Uganda but for me, the Great Wildebeest Migration has been my favorite. Each year, hundreds of thousands of wildebeest move throughout Kenya and Tanzania in search of lush vegetation and water. The wildebeest move as a herd as they face river crossings and threats from predators. I was lucky enough to see the migration from the Masai Mara, but the journey itself involves trekking over 1,800 miles, giving you plenty of chances to watch the natural spectacle. Try to align your travel dates with where the wildebeest will be, for a truly unforgettable experience. On the border between Zambia and Zimbabwe you will find one of the most incredible waterfalls in the world, as the Zambezi River crashes into a large crevice in the earth. These falls are twice the height of Niagara and well over twice its width. 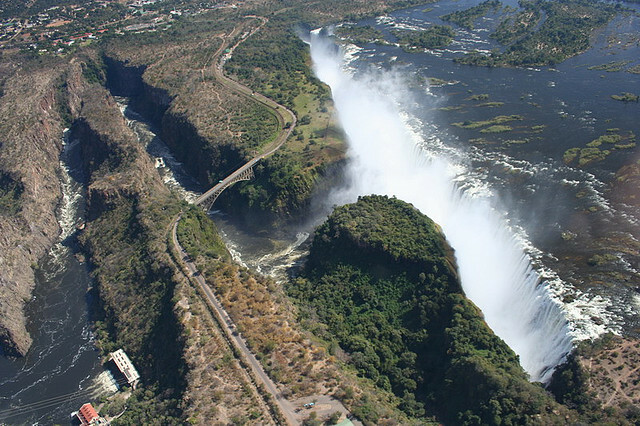 You can view these falls from either country, but it is probably best to see them from the Zambia side, as it offers better views of this enormous body of water. There are six main gorges where you can see the falls in all of their glory, and with a tour you can visit at least 5 of them. Nearby the area you will find plenty of activities around the falls, you can take a helicopter tour over them, you can bungee jump nearby and there will of course be plenty of photo opportunities. The only falls that I have seen which even resemble the might of Victoria was Iguazu in Brazil and Argentina, both of which offer examples of just how powerful nature can be. Have you experienced any of these natural wonders? Let us know if you have in the comments below, we’d love to hear what you thought.